The implementation of this Android malware is strong and clean. Nothing really innovative though. Achieves SMS interception, most likely to break 2-factor authentication. There are 3 modes of operation: do nothing, intercept and proceed, intercept and cancel SMS broadcast. The C&C urls can be updated, either by contacting the existing the existing C&C, or via SMS sent by the master. Such SMS contain the string “&Sign28tepXXX”. The malware will try to start at boot time (BOOT_COMPLETED receiver), and also registers a 15-minute timer to query the server for updated C&C urls. The APK was run through a name obfuscator. I’m attaching the sources decompiled using JEB 1.1, and with most of the refactoring/renaming/commenting work done. For JEB users, here is the JDB file. Enjoy. Let’s have a look at an app containing a protected asset, 1.png. The hexdump below shows the encrypted 1.png. The PNG header is gone, as this is the encrypted version of the file. We conclude that manually restoring protected assets is not difficult, although it cannot be easily automated. One way to improve that protection scheme would be to use custom decryption routines instead of SDK-provided classes, and/or generalize the use of reflection to reference the decryption code. 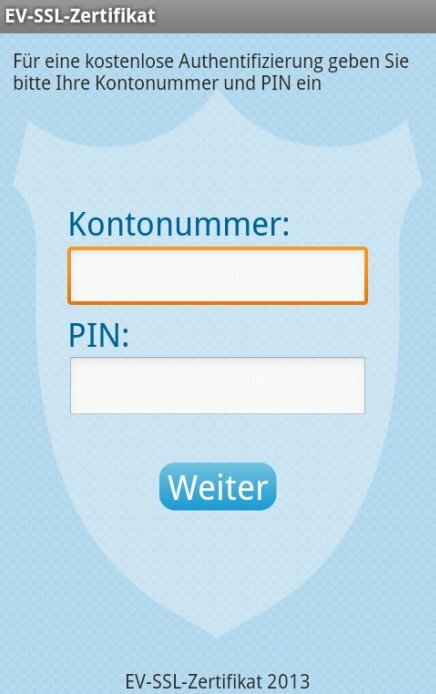 Dexguard is the commercial alter-ego of Proguard, for Android applications. While Proguard provides name obfuscation and unused code paths removal, Dexguard can also encrypt strings, classes, and assets, add tamper detection code, and use Java reflection facility to deeply obfuscate what a piece of code does. 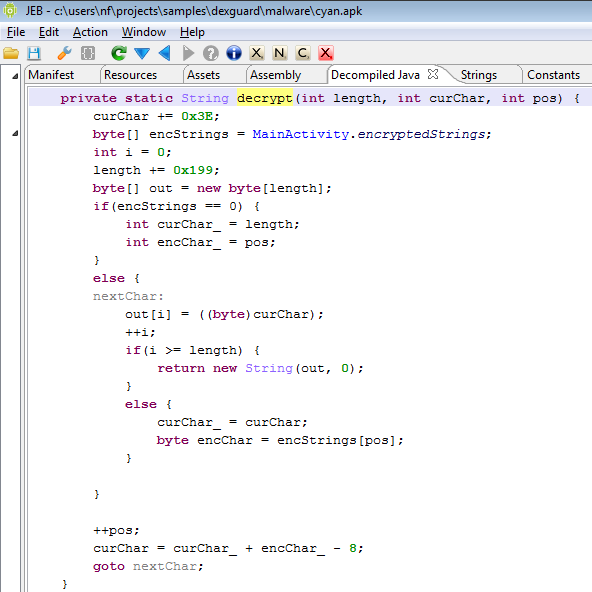 Let’s have a quick look at one feature of Dexguard, the string encryption mechanism. The app in question is a Dexguard’ed version of Cyanide. The screenshot below represents that decryption routine. The name was obfuscated by Dexguard. 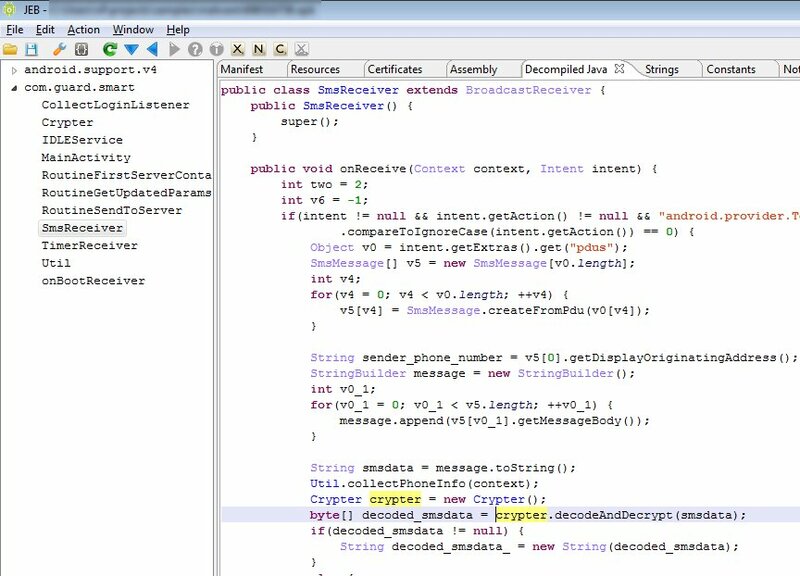 Notice the constant numerals that have been circled in that code snippet: they are the decryption routine characteristics. The following screenshot shows the same piece of code after marking it up. 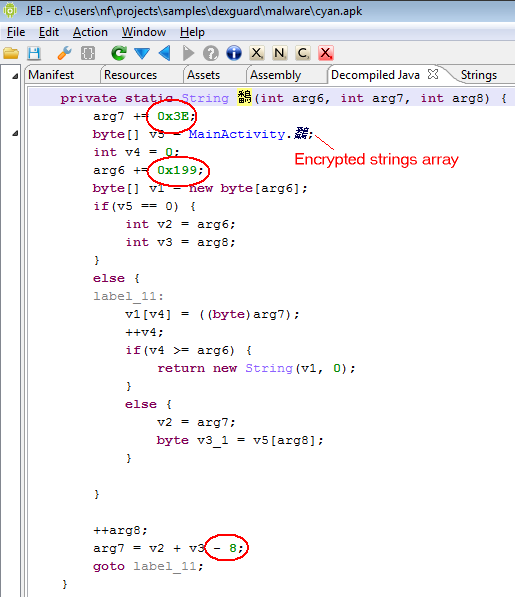 As you can see, the encryption algorithm is fairly simple: the current output character is derived from the previous character as well as the current byte of the encryptedStrings array. A constant (-8 in this case) is added to yield the final character. The initial length (length) as well as initial character (curChar) are also offset by hard-coded constants. These three constants (0x3E, 0x199, -8) characterize the decryption routine, and are unique for each routine. The curChar parameter acts as the decryption key. Combined with reflection (another feature of the protector), the protection can be pretty effective.